In the book, The Adventures Of Pearley Monroe, there are several lessons that I think are important. There is one in particular though, that I think is the central theme of the story. The kindness of other people can be immense. This shows up several times in the story. One time was when a man named Charles Stone saved the main character’s brother from a drowning in a river. This man hardly knew the boy, yet he risked his life for this boy’s life. This theme also shows up in modern life. Some people go to war and fight for other people, people they both know and don’t know. Doctors are kind and sometimes risk dying themselves by coming in contact with sick patients to try to help them. Even small things like donating money and starting a food drive count because they are all kind actions. Acts of kindness can be done by anyone for anyone. This shows up in another event in the book, when the main character learns that, after his grandmother had his father taken from her and she was in a free state, she was saving money to find him and buy him from his owners because he was still enslaved. Her friends had wanted all these fancy items, but when they heard what she was saving up for, they gave her their earnings. Despite her pride, the grandmother ended up accepting the money. Other people, whether they are known or not, can be kind. Teachers go through so much trouble to help educate children, but they still do it despite all the trouble. Teachers are some of the many people we all take for granted. More people who sacrifice so much but aren’t always recognized for it are parents. They sacrifice so much for future generations but some of these sacrifices aren’t even noticed. My mother does so much for me and my family that I take for granted. She takes us to after-school activities when she could be resting at home. She wakes up early so she can make our lunches for work and school. Sometimes I feel like she deserves to have an award for all this, but I take her for granted more often. There are many people that deserve to be realized for everything they do but aren’t. They still do this despite the fact that they aren’t recognized for it. There are so many lessons in The Adventures Of Pearley Monroe, and they are all important. After reading the entire book and thinking hard, I think that the central theme in this book is that kindness in others can be vast. nice job Aleeza I think you've explained this pretty well! Thank you so much guys! Your comments mean a lot to me. Outstanding job, Aleeza! You do very well in taking the idea from the book and then discussing it in real life. Your examples fully support the central theme you got from The Adventures of Pearley Monroe. Thank you for mentioning teachers-it's hard sometimes, but not a trouble. I love working with all of you! I like your real life examples. great job. I love that you saw the theme of KINDNESS. I think it comes down to living out the "Golden Rule" of treating others as you wish to be treated. Taking others for granted is easy to do, I am so thankful you are aware of the importance of showing your gratitude. Well done Aleeza! The Adventures of Pearley Monroe has been a great book throughout, but my favorite scene was when Pearley found out the true meaning of his name. The lesson I got from this was in life someone may have a desire to know what part of them means, and if that desire leads to their answer, it may end up being bigger than what was expected. In this book Pearley Monroe had a desire to know what his name meant. He finally found his answer, but it wasn’t what he thought. It was a lot bigger than he expected. In life it is important for someone to know who they are. If they don’t, they won’t know what direction they need to go in. That means that if someone doesn’t know who they are, they won’t know how to live their life because they won’t know what they’re good and bad at. If they don’t know how to live, what’s the point? That is why one needs to know who they are. It doesn’t matter if it’s knowing how to get a job or learning how to get into college. For all of those things one has to know who you are. If someone doesn’t know who they are while trying to get a job, they won’t know what they’re good and bad at. If someone tries to get into college they have to know themselves to see which college fits them the best. Pearley also found out a part of himself. In fact he found out part of his name. He didn’t start out trying to find his name but he did. From that he seemed to be more guided in life. He was also very proud of his name. That is another piece of knowing what part of oneself means, not only can in make them more proud, they know even more about themselves. All those little things can add up to something that is bigger . It can start out with someone trying to get a job and then it can become a life or death situation. It can become a scenario where if they don’t get a job they will not be able to make enough money to survive. If someone tries to go to college and don’t know who they are, they won’t know what college fits them. But if there is a certain job they want, it’s a whole lot harder to find a good job. What that means is if someone is trying to get a job that requires them to go to college, they can’t get that job because they didn’t go to college. I too have figured out part of myself. It was actually my name. I asked my dad what my name means, and he said it meant the name of his tribe which was the Enchima Tribe. After that day, just like Pearley when he learned what his name meant, I walked a little bit taller knowing where my name came from. I felt a lot stronger and better as a person. I was also prouder about my heritage, knowing that I had such a special meaning to my name. It was so special to me, and it still is to this day. People may want to know an aspect of their life, but their answer might end up becoming a surprise. If a person wants to know an aspect of their life, they can either ask a family member of research. There are usually always ways to find out a part of yourself. But the question becomes, do you want to find out? Figuring out a part of oneself can be helpful in anything. The Adventures of Pearley Monroe has multiple lessons and themes, that is part of what makes it so great. It was very difficult to pick my theme but in the end desire was the best one for me coming from my favorite scene, Pearley Gates. Nassali, that was really powerful, especially the way you connected it to yourself. That is a lot of thinking in that blog, Nassali! You have developed excellent support for your theme. I really like that you let us in on your name and connected it to the book. No wonder you enjoyed the Pearley Gates scene the most! Impressive work! I like your real life examples. How you took your name as an example. Great job!!!!! That is so interesting that YOU learned more about the meaning of your name because of the Pearley Monroe Book.What a great honor to learn more about your family history and heritage. You did a great job explaining why this was an important theme. Good job! There are many important lessons in Marci Seither’s book, The Adventures of Pearley Monroe, and one is, companionship gives people joy. An example of companionship in The Adventures of Pearley Monroe is Miss Nancy, Pearley’s grandma, and her faithful friends, Miss Rebekah, Mrs. Edward Conner, and Mrs. Johnson. An example of the three ladies helping Miss Nancy is when the gave her their hard earned money; all of them worked hard, but when Miss Nancy said she was working to buy back her baby boy, they wanted to help her. That brought the joy of seeing her son closer. The concept of companionship also appears in real life. At my school, people are joyful when they play with companions. I wake up in the morning and hope I will have fun that day. Then, I play with my companions and have fun. When I get sick, I get unhappy. If a person got sick, a friend’s get well card would give them joy. Companions help get people out of hard situations. In, The Adventures of Pearley Monroe, Pearley has a companion named Chen. A woman from Boston blamed him for stealing her diamond bracelet, because he was Chinese and she was racist. Pearley found the real thief, and Chen was let out of jail. A companion will protect their friend from racism. Most people have needed help at some point. A companion is somebody who takes care of a person when they are sick. Life isn’t perfect, and companions help people build themselves a brighter future. Simple things, like a game of tag can bring people joy. If I am sad, a joke with my friend makes me forget my hardships and be happy. A companion is somebody you play with, somebody you trust, or somebody who helps you. In some cases, companions help other people forget their grief. 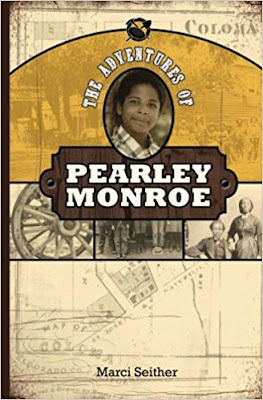 The Adventures of Pearley Monroe takes place in the 1800s, after the general excitement of the Gold Rush. The 1800s were a hard time, and everyone needed someone they trusted. An example of this, is when a newborn baby died. The Monroe family needed their companions for comfort. Pearley’s companion, Rudy, helped him out of his sadness by telling him about his ancestors, which distracted him from his grief. That helped the Monroe family get back to joy. Companions can deliver people joy. Companions are necessary. Companions and joy can move the world into a happier future. Carrie, I agree, this is an important concept in this book, and you proved it well. Your theme is a great one, Carrie! Your book examples are perfect, and your discussion of real life in sensational. You have examined many parts of companionship, and explained your thoughts so clearly. The organization of your ideas allows this to read very easily. Excellent job! GOOD JOB CARRIE, YOU DID GREAT!!! I like your idea of companionship gives people joy. Great job!!!!!!!!!!! Yes, I think the value of friendships is a huge part of the Pearley Monroe book. When I think about it , it has been my friends who have been there to share good times and also help me out when I need them. But, it is equally important to BE a good friend. I loved coming to your classroom. I can tell your class is full of people who love being together! I like the examples because a lot of feeling to the blog!! I also like that you included your name in there. It shows that you're proud of you and your family!!!!! Good,no GREAT JOB NASSALI!!!!!!! Sorry Carrie!! I didn't know you posted before I finished! I am glad to report I have made quite a bit of progress with Pearley Monroe since my last blog and finished the entire book from beginning to end. I feel it is a good time to update everyone on the continued adventures of Pearley Monroe. In this blog, I plan to tell you about a part of my favorite adventure of Pearley Monroe and an important life lesson that we can all learn from even today. Sometimes in life people may run into other people they do not know and it may seem they could be scary when they are really very kind. This came to light for me when Pearley and Cordelia were trapped in a cave and ran into some Native Americans. At first, it appeared the Native Americans were scary. However I learned they were actually very kind. The lesson I learned from this encounter was you should not judge someone by a first impression. I think this is an important lesson that Pearley put Cordelia behind her back when the Native Americans were pointing spears right at them. Fortunately, the Native Americans realized that Pearley and Cordelia were nice people so they stopped pointing the spears at both of them. I saw this lesson when the Natives first pointed spears at Pearley and Cordelia as they may have seen them as enemies but then noticed they were not enemies. The Native Americans completely changed their attitude and turned out to be really helpful. The Natives were very kind once they changed their attitude. They did a lot of things to help Pearley and Cordelia. First they helped Pearley with his ankle. They even helped them rest after the bear chase. They then gave Pearley and Cordelia some food. Best of all they took them home to their family. I really believe this was an act of kindness by the Native Americans. If someone did this for me this would help me a lot after being in a cave for about a day and being scared from a bear chasing me. This was also generous because the Natives could have given Pearley and Cordelia nothing and that would have made Pearley and Cordelia suffer. It’s nice to know that people sometimes run into other people in life they do not know and can really help by showing an act of kindness. I can only imagine how scared Pearley and Cordelia were upon first site of the Native Americans with the spears pointing at them. It was really nice to see the adventure turn into a life saver for Pearley and Cordelia that returned them home safely to their family. I enjoyed reading this book. I am thankful I had the opportunity to bring the book to life by visiting the California Caverns and seeing first hand what Pearley and Cordelia experienced with the bear and Native Americans in and around the caverns. I enjoyed meeting the author Marci Seither. It was really nice of her to visit our class and provide us feedback on our work. These experiences and meeting the author helped me understand why kindness was a key theme in this book. Even when people may be scared or in doubt, people can provide acts of kindness one may not expect. These blogs are very fun and educational. Great blog Kash! School is fun. I like all the proof you added, but you also balanced it out with your own thinking. Overall, great job! Your theme is a good one, Kash. Kindness from people we don't know is something we could all benefit from. Good proof from the text to support your big idea. I think school is fun, too! I think you had a lot of evidence in your mind to support your theme. GOOD JOB!!! Thank you, Makhai-we have a great class in which to have fun! I have fun, too! So fun to visit with you and your whole class! What a treat to see all the hard work you put into your well thought out art projects and reports! I am so glad you were able to go to Coloma and see the Monroe House for yourself. Sometimes in life people misjudge other people because of their race, but people shouldn’t. In the book The Adventures of Pearley Monroe, Chen, a Chinese boy, was accused of stealing Mrs. Barnsworths diamond bracelet because of Mrs. Barnsworths racism. It’s just sad. He was actually a nice person, not someone that steals. When I read the part that Chen got accused and no one stood up for him, I thought, “Why did everyone just stand there watching Chen get accused instead of helping prove that he did not steal the diamond bracelet?” Imagine if you were in the situation that you are innocent and are accused for stealing, but no one helps you out, it would probably be very tough for you. It’s more thoughtful to stand up for someone that can’t do anything for himself or herself. Like Chen, and other minorities, they rarely get to be treated fairly in the first place because of some people’s racism. That’s why people should be more thoughtful to other people more often regardless of their race. Unlike racism, being thoughtful makes more people in the world be the opposite, open-minded and caring. Good idea for a theme, Emily. People should stand up for others when racism occurs, I think. In the end, do you think Mrs. Barnsworth was racist or just uninformed? I really like your blog, especially because it incorporated both the fact that racism happened in the book, and put that it happens in real life. There were a lot of themes in The Adventures of Pearley Monroe. People who sacrifice and risk their lives show heroism. A lot of people showed heroism like Miss Nancy, Charles Stone, the Native Californians, and Pearley. They all showed that they sacrificed, and they risked their lives. Heroes aren’t people who fly, who have the latest technology, or aren’t from another plant. Heroes are people who are brave, who are willing to make sacrifices or even sacrifice themselves. That is only part of the definition for what a hero is. And sure enough the racoon came and stole the sparkly hair combs that Pearley and Luella used for bait. Pearley encountered a bear. Charles Stone saved two young boys. The Native Californians helped Pearley and Cordelia. Miss Nancy bought her son back. Now who are people in modern life who sacrifice and risk their lives who show heroism? Police, firemen, doctors, and people who are in the military are all examples of people who sacrifice and risk their lives and show heroism. My Grandfather, when he was in his 20s had to sign up for the military because he was poor. He fought in the Vietnamese War. He was a captain and led troops to battle. He told me it was very rough and hard. My Grandfather sacrificed and risked his life. He truly showed heroism.When people show heroism they can save people's lives, they can risk their own lives, or they can help others in dangerous situations. I agree Faisal, Heroes are a big part of the book and real life. Nice touch to use your grandfather's experience in a blog where you discuss heroism. Your examples from the text fit your theme well! Very good job on the Blog and heroes are a big part of the Book!☺��(+_+);-). Heroes are all around us. I am so thankful you are able to see what a hero your grandfather is. It takes courage to make a difference, even when we are afraid, a hero stands up to the task anyway. I think you picked up on a very important theme. Hi Marci! this is not Emily's blog, this is my blog. In life you shouldn’t judge someone by their culture but their kindness. I found this statement when Mrs. Barnsworth accused Chen of stealing the diamond bracelet. I chose this because I feel like he was being offended by Mrs. Barnsworth because he didn’t steal it. Mrs. Barnsworth should have learned a lesson to not judge someone by race or culture. Mrs. Barnsworth did and she apologised for what she did. I would apologize if I did that. I am happy to read this book. This book gave me knew lessons to spread. This book was a really good and will help people be more kind. I agree, I would apologize if I judged chen like mrs. barnsworth did. I like this book too Westyn! Good job?! I like the idea you chose for your theme. Where do you see that idea in the real world? It's an important idea for people to learn, I think. Judging others really hurts other people, but it also hurts us as well. Imaging what would have happened if Pearley hadn't found the real thief? I think learning to be respectful of differences and culture is a huge step toward peace. There are many themes in the Adventures of Pearley Monroe. One of the important themes to know is that a stranger's kindness can have an impact on others actions. There are many examples of this in the book. A miner named Charles Stone was an outcast in Coloma. People spread rumors about him when they didn’t even know him. But he did something nobody thought he would do. Charles Stone didn’t even know Pearley’s brother, Grant, but he saved him from drowning in the turbulent rapids in the American River. Charles Stone also saved another boy that he didn’t know from a fire. It didn’t look like Mr. Stone would live when he got out of the fire. He was unconscious. Charles Stone risked his life many times for people he didn’t know. He was on the rescue party for the Donner Party. By risking his life and saving others, the people thought well about him and wouldn’t be looked as an outcast again. Another example of a stranger doing kind thing in the book was the Maidu. Pearley and his sister, Cordelia, were trapped in a tunnel, hurt and hungry. Then they ran into the Maidu. Pearley recognized the Maidu but they were still strangers. The Maidu revived them and gave them food. They took the Monroe children back home. There are other examples of strangers doing kind things and this can carry over to the real world. Once my mom was carrying some bags that were too heavy for her and a guy walked up to her and asked if she needed help. My teacher showed my class a video how kindness passes on. The people in the video didn’t even know each other but someone did something kind to them. The kindness went in a circle. The person in the beginning did something kind to someone else and the kindness came back to him. They thought that doing something kind was the right thing to do. People should do what’s right to help someone even if they don’t know the that person. An impact on others actions can start by a strangers kindness. Good job Sean!That was a lot of your own thinking. Your final statement is a good way to end the blog as it sums up your theme well. I hope that people follow the theme you found in the book! I like your conclusion. It is very powerful. Awesome job Sean!!! People should not judge others simply because of their culture. In chapters 9,10,11,and 12 we met the Barnsworths and one of them is Mrs. Barnsworth. One of Pearley’s friends are named Chen and he was Chinese. Mrs. Barnsworth was quick to judge Chen based on his looks and his culture,but Mrs. Barnsworth wasn't being rude she was just uninformed still it probably hurt. When she said that ¨celestials¨ weren't very smart,but they were hard workers, that might've offended Chen or made him think she did not know much about his culture. Mrs. Barnsworth didn't actually know that to be true. She heard it from someone and decided to just go off of that instead of finding it out herself. I think she has learned a lesson not to judge anybody’s culture. People should not judge others without knowing the full story of them first. I do agree that people need the full story before deciding upon things. Judging people is risky-do you think it should be done at all? There are many likable themes in The Adventures of Pearley Monroe. My favorite theme is when Mrs. Barnsworth corrects her mistake because she learned a very important lesson and changed her attitude against the people of Coloma. People should be kind with each other. When Mrs. Barnsworth arrived at Coloma she was rude, racist, and ignorant. My personal opinion says the most unliked person is Mrs. Barnsworth, who judged other people by race and wealth. The first time that she offended someone in public was when she said, “Luella, mind the sun dear. You don’t want your face to freckle, lest you look like some of those leather-skinned miners we saw as we came trough Folsom.” I found this comment very rude, mean, and racist toward the the miners. Next, when Susan poured a nice glass of lemonade, Mrs. Barnsworth said, “Can you fix me a cup of tea? Or should I say, a good cup of tea?” This seemed as if she thought that people in Coloma didn’t know how to fix a good cup of tea. It shows that she was a judgemental person. Also, Mrs. Barnsworth addressed Pearley very rudely by saying, “Excuse me, stable boy. Will those horses be leaving any time soon? They seem to be attracting those pesky flies.” Stable boy isn’t the nicest way to address a 14-year old who is working hard every day. All in all, she talked with not much respect to others in Coloma, and she seems to think that she is better than everyone else, making everyone else feel meaningless. Kindness is a very important quality in real life. Whenever someone gives me a compliment I feel happy, or delighted with myself. If someone else treats me kindly I tend to work better in school, or my emotions stay very positive and help me stay positive with myself. If someone isn’t kind to another person, their emotions tend to stay sad, or their emotions are negative which keeps them off task because they are too sad to want to work hard. Some people that are homeless, or in need of kindness deserve kindness and assistance. A world of kindness would make the world such a better, happier place. The lesson that I learned was a very important one. Mrs. Barnsworth was uninformed, wealthy, and proper. But, she was also very rude to the people of Coloma. So the lesson was making sure to give kindness to others instead of giving rudeness and racism. The more kindness that is spread, the more joy there will be. I am glad to have read The Adventures of Pearley Monroe and learned such a important lesson. You have done a great job of generating an important theme, Alejandro! I think it's an idea that more people need to use every day. I like the way you have personalized it in your second paragraph, and you did well to summarize it in your final paragraph. Well done! I like your theme. Great job alejandro!!! THANK YOU MR. LA MARR, EDAN!!! You are welcome, Alejandro. You did well. Alejandro I agree with you in all your stated opinions of this character. Even though I have not read this book I can see why you dislike Mrs. Barnsworth so much! Through the examples you stated here one can see that this woman does not treat others as she would like to be treated (the golden rule). I especially loved your thoughts on what would make the world a happier place. Kindness and love are what is most important in life! There are many themes to the Adventures of Pearley Monroe by Marci Seither but as it is, there is one that is very important to me: even if a person makes a mistake that person should forgive themselves because everyone makes them. After Grant was feeling better from after almost drowning, Pearley sat on the porch. Pearley couldn’t forgive himself for what happened. Pa said, “I know son, sometimes things happen. I am just glad you are both fine,” he said. Pearley did forgive himself, and I think he did the right thing by doing that. In life sometimes someone will have regretted their mistake, and they will feel bad because of it. That’s why people need to help those in need. Someone might say something like,“Don’t worry, it's not your fault; it’ll be alright!” An example is like if someone was rock climbing, and the guy put his hand on a slipping rock, and the person he was climbing with got hit, he would feel bad, right? Well, if the other climbers comforted him that the climber would be healed and it was an accident, he would feel better. I have had an experience with this before, and it doesn't feel the best*. One day I forgot my homework and I knew what was going to happen. Just as I expected, I got a missing assignment sheet. We went inside the house, and I felt bad for what happened. My dad said everything would be alright and to be more careful and to pay more attention to my homework. An example from the book is the explosion at Gold Bug Mine and baby Rose's death. After the family delivered the produce, they had lunch. When Mama had taken the cloth off the lunch there was a deafening explosion. Pearley clasped his hands over his ears but the sound kept ringing. He looked back over at the timber frame entrance of the mine where black smoke began to billow out; covered in soot and blood, the miners gasped for fresh air. Pa and Benjamin sprinted toward the miners. “What happened?” Pearley rushed over to where Pa and Benjamin were quickly helping the injured men.”It was the blasting caps…” an old miner said. Soon after Cordelia cried out “Mama, Mama!” Old Duke has reared up because he was startled and hit Mama with the wagon something fierce. Pa told Pearley to ride back home and get Miss Nancy. Pearley then ran to the Burgess house to get Sara Ellen, the midwife. After the family brought Mama back, she had her baby, which was a girl and that was what Cordelia wanted. Sadly, Pa told Cordelia that the baby's breathing not well.Cordelia got to give the baby a name, and she called the baby Rose. She called the baby Rose because that's what color the sky was. The family was sad, but they were glad that they knew Rose. When Pa was building baby Rose's coffin, Pearley felt very very bad. He felt that it was his responsibility to take care of his family. But he was also mad at the people at the Gold Bug Mine. He said it was their fault that Rose came into the world too early. But Pa reminded him of Mr. Anderson,and how he wouldn't be walking on both legs anymore if he had actually lived through the night. The miners probably felt bad too, and the sad thing is, they probably didn't have anyone to tell them the explosion wasn’t their fault or anything else like that. Then Pearley realized that he'd made a mistake which was fine. He also realized that it wasn't the miners’ faults and that the explosion was just an accident. Then the family had to go to the funeral for baby Rose. Pearley got himself together and left. As you, the reader, can see, comforting others is very important in life. This can help others not feel so bad when they make a mistake. Comforting others lets them know that they are not alone. It also makes them feel less guilty. It is normal to feel a little guilty when a person makes a mistake. Mistakes are normal and if you forgive yourself, it will make it a lot easier for you. Great Job Mahkai! I like how you added your real life experience. Good work, Makhai! I like the message of your writing. You have excellent text evidence to support it, and your personal experience gives power to the writing. I really like the conclusion as you have ended the piece with a great reminder of your message. Thanks Mr. Lammar!! Thank you for the positive commenting!! By the way, have you sent it to Marci? There are many themes to Marcy Seither’s book The Adventures of Pearley Monroe. Sometimes when people judges another person what they say is not always true. A character in the book named Chen Ho got accused of stealing a bracelet when they had. no proof that the boy chen had stolen the bracelet. The woman that accused Chen had no proof that Chen actually stole the bracelet. But back in that time the board didn’t care what the chinese thought. Since Chen Ho was chinese and the accuser was from Boston the judge would put Chen Ho into jail either way. The judge gets $300 dollars for everyone that is held guilty and $150 dollars for everyone that is not held guilty. Then one boy named Pearley, Chen Ho’s friend, and one other person Luella made a plan to prove that Chen Ho was and still is not the real thief. There are many different themes in The Adventures of Pearley Monroe. Sometimes when people judge other people what the person says is not true. I like the theme statement that you found in the book, Bryan. How do you see it fitting in the real world? Should people make judgements about others at all? This applies in the real world as students getting bullied in Middle and High School. Other students may spread rumors that are false and could hurt a person and what others think about them. I don't think people should make judgements, tease or bully other people. I think this because it's mean and harmful. There are many themes in The Adventures of Pearley Monroe to take into account. To reach a goal, people need to have pride in themselves. Miss Nancy has pride by not needing anyone to find Andrew and pay for him to come back. Miss Nancy took the money from the three ladies that offered her money to pay for Andrew, but only after she rejected the money. This proves that Miss Nancy has pride in herself and that she is a woman that will never give up on her goal. Miss Nancy is a person who never gives up. When no one helped Miss Nancy, when no one supported her, except for her friends, she didn’t give up. She tried and tried with nothing but her friends and her pride to help her get through the hardship of losing Andrew. If I was a father, I would never want my own three-year-old baby getting pulled out of my arms and sold. I would never have enough pride in myself to find my baby and bring him/her back. I wouldn't have enough pride in myself because I'd be scared. I'd have no faith, no confidence, no pride. Yet nothing stopped Miss Nancy from giving up. People should never stop having pride even when there are hardships in life. Miss Nancy would never have given up, so why should any average person give up? Having pride helps people reach their goals. With no pride, it would almost be impossible to reach any goal because if any person doesn't have any pride in themselves, they won't be able to believe that they can get up again. "I think that the quote by A.P.J. really sums up the whole idea of my theme well. A. P. J. Abdul Kalam said, Never stop fighting until you arrive at your destined place - that is, the unique you. Have an aim in life, continuously acquire knowledge, work hard, and have the perseverance to realize the great life." this quote is a very deep, profound quote. Nothing stopped Miss Nancy from taking a shot and reaching her goal. That is an interesting thought to tie pride into accomplishing goals. I think you hit it when you said, "With no pride, it would almost be impossible to reach any goal because if any person doesn't have any pride in themselves, they won't be able to believe that they can get up again." That's an excellent point. I like the quote you found, too, Etai. Nice job! In The Adventures of Pearley Monroe by Marci Seither there are many themes and topics to keep in mind. People should always have bravery and courage to save others in need. These are important to have, people need courage to step up for themselves, bravery too. Bravery and courage can help in many life situations. Charles Stone dashed into burning building to save a boy.He also jumped into a strong river to save another boy.This takes a lot of bravery and courage.If it weren’t for Mr.Stone’s courage and bravery, two young souls would not be alive. Charles Stone is a very brave and courageous man, but he is not the only one. Pearley is also brave. He was willing to step in front of his little sister to save her from getting killed.When someone is brave it can save a life, such as when Charles Stone dashed into a flaming building to save a boy. In my opinion this also took courage. He almost got killed! These are real life situations.Those actually aren’t real life situations-they are from the book The world needs more people like Charles Stone! When someone saves another it does impact the world. When a life is saved then that soul can save another. It becomes a chain reaction and more people can live and become firefighters, doctors, lifeguards, and more, all able to save a life.The world can become a better place with some bravery and courage. When someone shows these traits it can bring it out others too. In the book, many people show courage, bravery, or both. Miss Nancy shows courage by waiting 27 years for her son and working so hard to get him back. In the end she did thanks to her courage. Pearley shows these traits when he stands in front of his sister to save her from a spear. Finally, Mr. Stone has saved many people’s lives, a boy from drowning and a boy from the burning building. In the world there are many jobs for saving lives and sometimes people see others in trouble and save them. These people have a desire to make the world better. Overall saving a life can save a majority of the world because kindness can and does spread; spread throughout the world. If someone sees someone else in trouble then they should save them, just like Charles Stone. For these reasons everyone should thank doctors, firefighters, scientists, and others who save lives. They save lives, and it does have an impact. Overall, having bravery and courage helps the world! People are out there that are life savers. We might not be alive without them. When one life is saved many more can also be saved. So when one sees someone in trouble one should help them. There is an impact. Be courageous. Be brave. Bravery and courage are two big traits that can help the world. I like your theme, Selena! The conclusion does a very good job of summing up your ideas, and leaves the reader thinking about what you've said. Nice job! A person’s kindness can have a positive impact on others. I see kindness as a theme in Marci Seither’s book The Adventures of Pearley Monroe so many times. Charles Stone saved Grant from the American River, or when Charles Stone saves a boy from a flaming building. Another example is the three ladies gave their money to Miss Nancy to buy her son back. These acts show a lot of kindness. Sometimes people you don’t know will help you get up or they will go get someone to help. Charles Stone showed an act of kindness because even though he was a stranger to Grant he still saved him from the turbulent water. That showed kindness to me because a stranger saving a kid that he doesn’t know from dying is a big deal. Another example of kindness is when Charles Stone saves a boy from a flaming building. Again Charles Stone saves a boy he doesn’t know at all. This shows that Charles Stone is a very kind person. An act of kindness again in The Adventures of Pearley Monroe is when Mrs. Winters, Mrs Conners, and Miss Rebekah gave their money to Miss Nancy to buy her son Andrew back from slave owners. This is kind because to give someone all your money that you’ve been working so hard for; to save enough to buy something nice, then giving it to somebody is very kind. Just because strangers are someone you don’t know doesn’t mean they don't have a good heart. One time I was hurt and someone I totally didn’t know helped me up when I got a scrape on my knee. People sometimes have a good heart but you do not know them so you don’t know that fact about them. If that person you meet has a good heart you should go talk to them and ask them a story of their life. If they don’t want to tell you, do not press them. You won’t know if they have a good heart or not. What I mean by having a good heart is that person is kind, respectful, and thinks about others. When my dad was sick one of his patients gave him a tea bag and said “I hope you feel better”. To me that was kind because to say something like that was very nice but to give someone something too is very kind. My teacher gave me a book that was special to him and he gave it to me so I can read it and enjoy it, which was very kind of him. Someone will only know if a person has kindness if they go talk to them. People show random acts of kindness every day. You could be the one to do it, or you can be the one that receives it. Either way you should always be kind to someone. Try to do an act of kindness every day. For example at school partner with someone that doesn’t have a partner, or play with someone you don’t usually play with. This is a theme I am getting from Marci Seither’s book The Adventures of Pearley Monroe. I think the whole world would benefit from more kindness. That's a good theme to pick out of The Adventures of Pearley Monroe, Cassius. You've done a good job of mixing your thinking with the text evidence to create a solid blog post! Well done! In The Adventures Of Pearley Monroe, there are many important themes. One of the most important themes is about kindness. People might be kind enough to risk their own life for another life. This theme fits mostly in chapter one when Grant almost dies, and the kind miner saved him. Grant almost dies because he got carried away in the turbulent, foamy water of the American River. The miner almost died trying to save Grant. Being kind is important in life. It is important in life because being kind can lead to a new, improved life. It is also important because when someone is kind, it leads to more and more people being kind. More people being kind is good because it is helping people work together effectively. Being kind can change the world from bad to great. When I am kind to someone else, they thank me or put a smile on their faces. Sometimes they even play with me whenever they get a chance to play with me. The people who I play with really enjoy having fun with me. Also when my neighbors let me come into their garden, I am aloud to take some of their fruit home. I don’t have to pay anything back except for their kindness back. Marci Seither had gotten pulled down from the current in a river. The current that Marci was in was not as strong as the one that Grant was in. Therefore, there would be more of a chance that Marci would survive. If I was in a strong current I would expect that my brother, sisters, or parent would try to save me. If they did not save me in time, I would probably die. If I was lucky, I would survive. Why did Charles Stone even bother to save Grant? The answer is, he was a nice, kind miner. If Charles Stone had been kind enough to save me, I would be very delighted that he had saved me. I would try to do something kind back that would make him delighted. I think Charles Stone is one of the nicest people in the whole book. He should be one of the characters that are the most remembered for his kindness. When people are kind, are kind, the world is improving with kindness for every word they say. However, not everyone is nice so not everyone has kindness in them. Charles Stone was very nice and he had saved many lives because of his kindness. He also helped other people in other ways. People should always be kind no matter what they say. Also, when someone is kind to one, respect that and be kind back. Kindness is what the world can always use more of, Nari. Good theme to pick out of the book. You've done well to point it out. In the book The Adventures of Pearly Monroe by Marci Seither, there are lots of themes, but one that stood out to me the most was motivation. Motivation is when someone or something drives a person to do something. In life, events can motivate a person to do great things for others. A example of motivation from the book was when Pearly climbed the tree to get the bracelet from the racoon. He could have given up when the branch broke but he didn’t. Pearly was motivated to prove his friend Chen Ho did not steal the bracelet and he would do whatever he could to prove it, including finding the real thief. Family and friends frequently motivate us to things like take risks and persevere through hard times. That is often the motivation we need to succeed. Parents motivate their children to be good people by teaching them to be kind, thoughtful and grateful. A real life example of a good person is a firefighter. Firefighters are motivated to risk their lives to save people they do not even know. Teachers are another type of motivator. They teach you how to read, write, and do math. They find fun ways to motivate students to learn, which increases the willingness to listen pay attention. In the book, Charles Stone was helping the Donner search and rescue party when his wife and daughter got Influenza. He found out when he got back home that they had passed away from the sickness. Mr. Stone was then motivated to save other people’s lives because he wasn’t able to save his wife and daughter, and he didn’t want anyone else to go through the pain he was going through. This was the reason he saved Tomas. He felt so guilty that he could not do anything to prevent his family from dying that he saves others for the feeling of saving someone else's life. The author, Marci Seither, is an example of a motivator as well. Good authors motivate readers to continue reading more of their books. The book The Adventures of Pearly Monroe had multiple themes, but motivation was the one that stood out most. There were multiple times where being a good person was the motivation for the characters. Just like in the book, motivation is found in everyday life. Well done Ravyn! I like that you have found the concept of motivation in the story. What you write is so true, that motivation can bring about great things for people. Your thinking is a unique way of looking at what the characters did and why they did them. Good thinking! There are many themes in the book The Adventures of Pearley Monroe by Marci Seither. One theme that I think is very important is that people should show kindness by helping others they don’t even know. We see this in the book in several places. For example, we read about a man named Charles Stone who saved a child he didn’t even know from drowning in the turbulent water of the American River. This is a great example of kindness. Another great example in the book is when Pearley and Cordelia are lost, the Maidu tribe helped them find their way home. The Maidu tribe also gave them food and helped make Pearley a splint for his injured ankle. I’ve learned about showing kindness to strangers in my own life. When I go to Sunday school I bring money every week, which is collected by my teacher. All the students usually do this too. At the end of the year we decide where to donate the money. We have donated to animal shelters, homeless shelters and soldiers who fight for our country. Also, when Halloween comes I take my candy, and I donate most of it to the military. Also, my grandma makes dolls and sells them. She takes the money and donates it to the Mustard Seed School, a school for homeless children. When Thanksgiving comes, I go to San Francisco and go around giving bags of food and supplies to the homeless. These are just a few ways that my family and I have helped people we don’t know. I see people in my community showing kindness to strangers. I remember learning at Sutter’s Fort that the people working there volunteered to help so that we could learn about history. These people donated their time to help us learn, and they did it without getting paid. They did it with kindness. Also, volunteers at the hospital show people where to go or read stories to children that are not well. Like the volunteers at Sutter’s Fort, they do not get paid, they just want to help people who are sick. Of all the themes in the book The Adventures of Pearly Monroe by Marci Seither, I think showing kindness to strangers is one of the very important themes. This is important because kindness helps to create a better community. Great real life examples, Edan. Your ideas support the theme statement, and you've used good ideas from the text to set up your theme. This is well organized, and the ideas flow easily making it enjoyable to read! I AGREE MR. LA MARR!!! Just because someone judges a person, doesn’t mean that judgement is true. I learn this in story, The Adventures Of Pearley Monroe, by Marci Seither. Mrs.Barnsworth judged Chen Ho when he had just looked at her diamond bracelet. She said that Chen should be put in jail for stealing her diamond bracelet when she had no proof at all that he had done this. Chen, an innocent fourteen year old boy could have been put in jail for life, because back then Chinese people couldn´t have gotten a lawyer to get them out of jail. The rule now is that one has to be proven guilty, instead of being proven innocent. We have this rule to be fair about who is put in jail or not. Bad rumors might be spread if we didn’t have this rule, also. Pearley and Cordelia were in a mine and found themselves stuck and lost. Eventually, they came across several Native Americans who pointed spears at their chests. Pearley and Cordelia screamed because they thought the Native Americans would kill them. The Native Americans turned out to be nice people and took the Monroe kids to their village. They fed them and made a splint for Pearley’s injured ankle. Then, they took the Monroe children back to the blackberrypatch where the family and search party were searching for the kids. Pearley and Cordelia learned not to judge people at first sight. In life, if a person judges someone wrongly with no proof of judgment, it isn’t always true. Sometimes I judge my mother’s food wrongly and I say “bleh! That’s disgusting!” Then, I try the food and I really like it. Also if we did not have misjudgments, we would not have as many wars. A judgment that someone makes without evidence like Mrs. Barnsworth about Chen, and a judgment with little proof like Pearley and Cordelia with the Native Americans are not right to make. An assumption that someone may make without evidence, usually isn’t true. I fully agree that when people make judgments without any evidence, the likelihood of being wrong is huge. It's hard for some people to avoid that, as they see something, and immediately come to a thought. Your theme is a good one for people to remember, Eli. Being kind and selfless can help others in trouble. There are many themes in the book The Adventures of Pearley Monroe, by Marci Seither, but this one reoccurs throughout the book. For example, a miner named Mr. Stone ran into a burning building to save a boy’s life. He got the boy out of the building, but suffered physical injuries. Sometimes people may risk their own life to save another's life. Firefighters and policemen are people like this. Firefighters run into burning buildings to save lives, just like Mr.Stone. If everybody was like this, the world would be a lot safer and less people would get hurt. If more people could just join a search and rescue team it would be a big difference. I know that a lot of adults have saved a person’s life, and even some kids have. You probably see someone who has saved a person’s life every day. Usually you just don’t notice it. The book, The adventures of Pearley Monroe, has made me notice things more and make me pay more attention to things that I probably didn’t pay attention to before I started this book. This book makes me more aware. For example I didn’t think about slavery before I read this book. Mrs. Nancy’s story helped me think about how hard it was for real people. There are many themes in this book,but I chose this one because it shows that if one is kind and selfless it can help another.The book, The Adventures of Pearley Monroe , by Marci Seither, hooks you on until you get to the end. It makes me want to read it over and over again. I like your fourth paragraph Eli,I get what you mean. Your conclusion is very powerful. Great job Sofia!!! You have some good examples of people who are selfless, Sofia. I also like the idea that this book got you to be more aware of ideas that are around you. That's what reading can do for people! There are many theme statements in Marci Seither’s book The Adventures of Pearley Monroe. One of them that should be remembered is that we should treat each other fairly and not make judgments about people who might have a different culture or religion. A character who was visiting Coloma from Boston by the name of Elizabeth Barnsworth had judged Chen Ho, a young Chinese boy. She always called him a Celestial. Mrs. Barnsworth said, “I don’t imagine Celestials being intelligent, but at least they are hard workers, from what I have been told.” That shows she didn’t know how intelligent Chinese really were and didn’t care to find out either. Mrs. Barnsworth had a diamond bracelet, and one day she found it missing. She accused Chen Ho of stealing it. Some people also judged Charles Stone. They had judgments about him such as: Charles Stone has been running from the law, Charles Stone has a bobcat guarding the gold he has buried under his cabin floor, and many others. People can be different in many ways. They can be different by race, culture, religion, physical limitations, and even appearances. When a person judges another person that they don’t really know about, they often make an incorrect judgment. Sometimes, incorrect judgments result in bad consequences. When Mrs. Barnsworth wrongly accused Chen Ho of stealing her diamond bracelet, Chen Ho was put in jail and was separated from his family until he was proven innocent. Charles Stone lived alone but turned out to be a hero who saved Grant, Pearley’s younger brother. It is not kind or compassionate to judge others. People who judge others feel that they are more important or better than the person they judge. A person who judges another in a bad way is inconsiderate. They really don’t care about the other person, or they don’t care to find out the other person’s story. When a person treats another person unfairly, or unjustly, they make the other person feel unimportant and unhappy. It is better that he or she later tries to find out more about a person than to judge them. When a person judges another, others might start to follow the person judging. It is not good to judge others because of that. For example, I had a former schoolmate who had physical disabilities. It was sad to see that some students joined in to make fun and judge him. We should not judge. We should treat others fairly and try our best not to judge others. When we are judged by others, may we be humble to correct ourselves if the judgment is right. Let us be patient with each other and practice the Golden Rule. That way, we will be able to make the world a better place. This is interesting to read, Amy, and you have offered many good examples to support your theme. Your final paragraph is strong to hammer the point home, and I really like your sentence that says, "When we are judged by others, may we be humble to correct ourselves if the judgment is right." That requires us to examine ourselves some, reflect, and make changes if need be. Great job! The importance of family becomes even more important when a tragedy occurs. We see this lesson in the story, The Adventures of Pearley Monroe, by Marci Seither. There were big and small tragedies throughout the book . In paticlear, two examples show this lesson; Miss. Nancy has her baby taken away and the loss of baby Rose and the explosion at the Gold Bug Mine. The first example of the importance of family is when tragedy occurs is when Miss. Nancy’s three year old baby Andrew gets taken out of her arms and sold for wagon train fees. Miss.Nancy saves up money for 21 years to buy Andrew back into her life . She wanted Andrew because ten years before her husband dies and she is lonely until she gets Andrew back. The people that lived in the 1800s had many tragedies throughout their lives but they kept pushing on in life. Family is this important Miss. Nancy that she is willing to save up for that many years to get her baby back. The second example is when baby Rose dies after the explosion at the Gold Bug Mine. Ma has baby Rose to early and her lungs weren’t developed enough for her to breath. The family helps one another by supporting each other. They let Cordelia name the baby, Rose. Another example is when Pa helped calm Pearley down and told him it is alright to be sad but not angry at the people who were there. I learned that sometimes people need to lean on ones family to have comfort over a tragic event. I also learned to always love ones family so when a tragedy strikes everyone can help one another. This book has taught me that one should love ones family no matter what. Loving ones family is critical because they gain a stronger bond with each other, they also gave each other love when needed most. The theme the importance of family is important because family is important every single second of ones life. I like the theme of the importance of family, Wesley. I think that the book truly shows that, and you did well to pick that idea out of the text. Your examples are good to prove your thought! If anyone work hard enough they almost always achieve your goal. This is a lesson Marci Seither showed in the book, The Adventures of Pearley Monroe. In the story a woman by the name Miss Nancy lost her son because she was a slave, and her child was sold,so she and her owner could go west to California. When California became a state , she was free. She was free because California was a no slave state. Over time she saved enough money to by her son back, and they were reunited. This is true in the real world too, people are faced with a problem. They must work hard to solve the problem. If they work hard and never give up, their work will be rewarded, and they will have achieved their goal. If they give up, they will never achieve what they want to and will fail. People only completely fail when they give up. Even if the result is not what they want it to be they need to keep in mind that not everything works out. Later they can try a different approach or if they are satisfied then they can keep it the way it is. Take a school project for example. When I had a school project I failed what I wanted to do and tried again. . I could not give up even though I felt like it. This worked out and this is the way I turned it in. I think this is a lesson that can celearned in The Adventures of Pearley Monroe. That if anyone wants to achieve their goal they need to work hard. I like the message in your theme. I have always believed in the idea of working hard as, you are right, that's what helps a person achieve his or her goals. It doesn't always work, but again, you are right, if a person gives up, the goals will not be accomplished. Good idea, Joey. I think that you are right. You did a good job Joey. There are many important themes in The Adventures of Pearley Monroe, but my favorite is; people can face a challenge but their love can help them overcome the conflict. All throughout the book, our main character Pearley faces many challenges such as a bear attack, his baby sister dying, and his brother almost drowning. Many of the people who have inspired me faced challenges, and their love for their cause and positive perspective helped them overcome their challenges. From Pearley’s first adventure (his brother almost drowning) we see that his love for his family is powerful and can he do more than someone would think. Another example from The Adventures of Pearley Monroe is when Pearley and Cordelia are stuck in a cavern. Pearley is hurt, but he is determined to help his sister get out. This is because Pearley loves Cordelia and is willing to save his sister, even though his ankle is broken, because he loves her so much. Harriet Tubman, one of my inspirations, had a problem; she was a slave. After she escaped, she came back for her family. One of the reasons she escaped was she wanted a better life for her family. Her love made her come back to help her family and other slaves. In a book I recently read, the hero fights for her family and her friends. She fights a super villain for them. Even though she is a superhero, this is still a powerful act of love. Recently my family caught some kittens that were born under our deck. It was challenging to capture them, and it was hard to give them away to the shelter. We knew that giving them the chance to find a home was the right thing to do because we loved them. Someone doesn't have to be famous to overcome their challenges with their love for a cause. Love can help overcome challenges that people can face. If someone has a positive perspective, and loves what they are fighting for, they can achieve their goal, overcome challenges, and become a better person. You have found a very powerful theme, Elanor. The text examples you give support the theme well, and your real life discussion brings the theme to life. The ideas in the conclusion do a great job of summing up the strength of your theme. Well done! Sometimes happiness can come to one, but it might not last long. We see this in the chapter “Good-by Rose” in the book“The Adventures of Pearley Monroe” by Marci Seither. Rose, a baby in the Monroe family was born. At first, they were happy that they had another member of the family. Then they realized that she might not live because her lungs were not developed fully and she was premature. She passed away and Pearley, her brother, was angry. He was angry because in the chapter before, Mama was at the Gold Bug Mine explosion, and their horse reared up and the wagon he was attached to hit her. It caused her to have her baby too soon. Pearley blamed the mine people for “killing” baby Rose. Sometimes babies die when they are being born. My sister and I would have been a triplet, but the other baby died in my mom’s stomach. My brother also would have died because the liquid in mom’s stomach started leaking out when the doctors poked a hole in it. When a baby dies, usually, the family has grief for them. Every time a baby is born, a new person comes into the world; when a baby dies, a part of the world leaves. Losing a baby can affect one’s life. It was common for babies to die in childbirth in the 1800s. The Monroe family found other happy times. Sometimes happiness can come to people, but it might not last long. The Monroe family was happy for a brief time. Then they were sad because baby Rose had died. After something sad comes, something happy may come following that. Any family could go through something sad like that. The Monroe family went through some harsh situations, and they experienced more problems than losing a baby. Sad theme, but unfortunatley, it is true sometimes. You have selected good ideas to support your theme, Jinjoo, both from the text and from real life. I hope that the happy times outweigh the sad ones! This is a GREAT selection of ideas, 4th graders. You were challenged to find the ideas from The Adventures of Pearley Monroe and explain them in terms of real life. The ideas you found are varied, and I think each of them is in the book. Your explanations are well thought out, and some of the ideas in this blog are well beyond the years of a 4th grader. You have impressed me, for sure, and I hope that our readers are just as impressed. Job well done Innovators!